We must be mad, the Hubby and I. 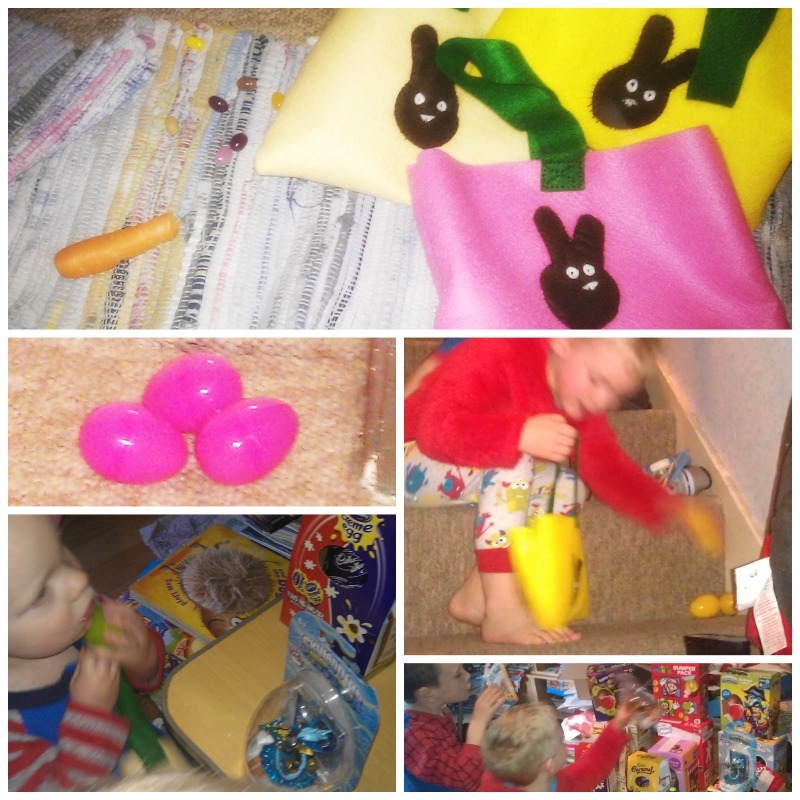 After the kids were all settled in bed on Saturday night, we started to get the Easter eggs laid out for them, and to fill the plastic eggs with treats for their egg hunt. At this point we realised that we had no idea where their little green felt basket was that they have used in previous years. It wasn't where we thought it was, and we couldn't see it anywhere. So we thought we would just "knock together" some little bags instead. One for each boy. It seemed like such a simple and easy solution.... I mean, it's not like I've never made bags out of felt before, any they din't need to be amazing quality because they are only for the egg hunt the next day. But that was before they got complicated. We couldn't agree in a handle to start with. I won the argument with a single strap going over the top of the bag, ideal to carry on one arm, and more importantly, QUICKER than two. The I had the amazing suggestion of appliek Easter motifs like eggs or bunnies. Hubby cut out some bunny shapes for me to stitch on. At 11:30pm we were still stitching bags and not even hidden the eggs yet!!! We were all done just before midnight, including a pile of completed bags, half a carrot, and some Easter Bunny Poop (jelly beans) all arranged just outside the kids bedroom. It was so very worth it the next morning though. Around half six we heard Georgie come out of the bedroom, spot all the stuff and call out "Tom! Look!!" then toddle back into the bedroom to fetching his brothers before sitting down in the rug to demolish the "poop". Jack & Tom took charge of the egg hunt, and made sure that each of them had the same number of eggs at the end. Tom declared it the "best day of my life!" and Jack said it was "Awesome!"